People often ask me how I find the time to blog so regularly. "How do you think of things to write about?" "How long does it take you to write a post?" Blogging is like any other hobby. You do it because you love it. You love it because you're good at it. You're good at it because you're dedicated. I could keep going, but I think I'll stop here. It's usually not difficult for me to select a topic. The topic is always the same -- me. My blog is effectively sanctioned narcissism. And yet more and more people keep reading. Rejoice! As for the amount of time it takes for me to draft an entry, the typical range is anywhere from five minutes to an hour. I do my best to cap it at an hour, or else the exercise ceases to be fun for me. If I need to upload pictures, I fire up Flickr and then go eat dinner or do something else while my pictures load, so this doesn't factor into my hour limit. Glam can attest firsthand -- I can compose very quickly, thanks to a powerful combination of rapid thought bombardment and typing like the wind. Words come naturally and at breakneck speed. I've never been one to mull over my casual writing too much. And the sleep question? Even with my generally expeditious blogging, I go to sleep really late. That's just because I'm tinkering with other fun things on the Internet. And watching TV. Lots and lots and lots of TV. But you knew that already. Sometimes I start a post, leave it open for hours, and then come back to it. The total time spent actually writing, though, rarely exceeds an hour. Exceptions are travel posts and more introspective posts. 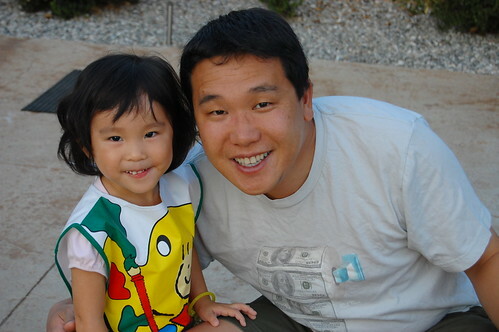 But here's the main reason I try to blog regularly -- I hate catching up when I haven't blogged for awhile. Catching up inevitably breaks my one-hour rule. And, yet, I can't bear to forgo documenting whatever I failed to chronicle several days ago. (1) Glam is back from maternity leave! Bax was the mastermind behind all these decorations. The sparkly bugs are an homage to all the nasty critters Glam first discovered in her new office's drawers when she visited a couple months ago. 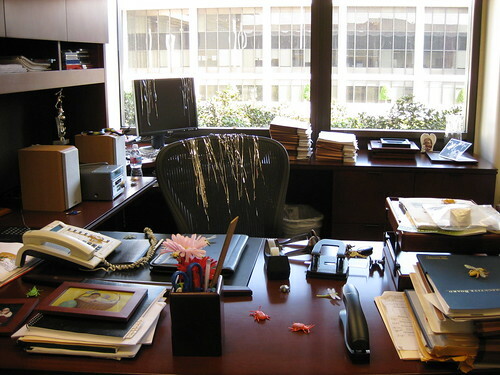 The office has since been fumigated and was actually given to Backdaddy, while Glam moved into another office nearby. We thought these fake bugs were much better than the real ones. 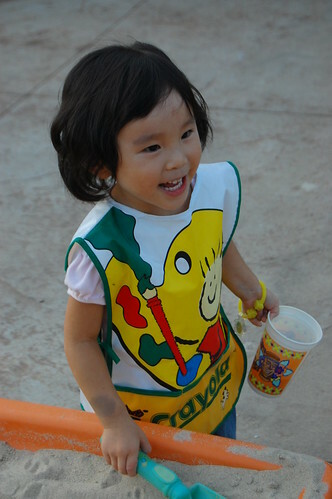 (2) Giggles is currently observing Ramadan. She can't eat or drink anything from sunrise to sunset for 30 days. Tough times for Giggles during the month of September! I am fatigued just thinking about it. Weaksauce Monkey. On a selfish note (because, as you've already read, this blog is all about me), this means no fun lunches with Giggles for a long time. Sad face. 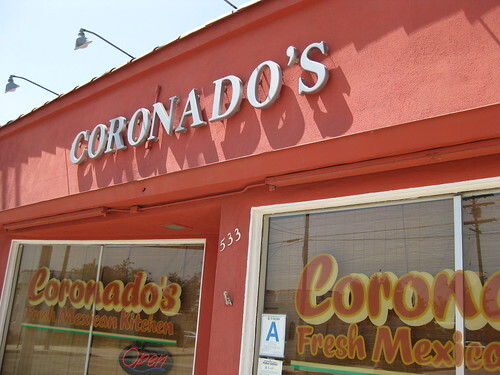 (3) I finally tried Coronado's, the inviting little coral-colored Mexican restaurant that the Monkeys have driven past for years on the way to see Little Monkey Niece. Why have the Monkeys never entered this happy little building? The short answer is that, when we go see LMN, Mr. Monkey's father is part of the plan, too, and he almost exclusively eats Asian food. Hmph. But Glam is not Mr. Monkey's father. Woohoo! Coronado's was actually Glam's suggestion, and I excitedly told her what I said above -- finally I'd go inside! She raved about the pan dulces, so clearly we had to investigate the deliciousness of the restaurant's lunch offerings. The green salsa was damn good. 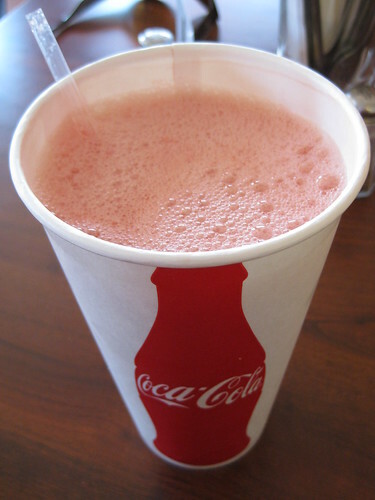 I loved my watermelon agua fresca. 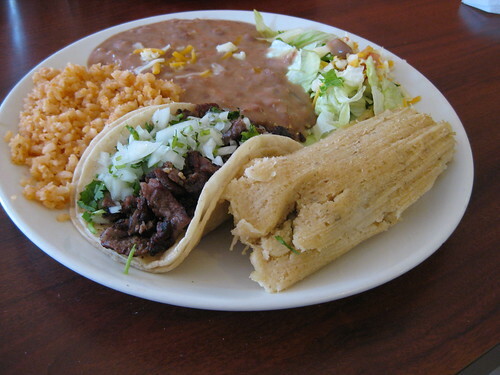 Here's my carne asada taco and chicken tamale combination ($6.75). The taco was very good, but the tamale was a tad dry. I'd actually wanted a pork tamale, but they had run out. Maybe the pork ones are better, seeing as how there were no more left, and the restaurant seems to take pride in its tamales. 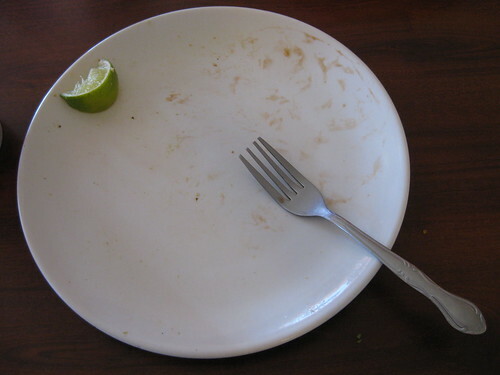 Even so, here's my plate at the end of my meal. I think I was really hungry. 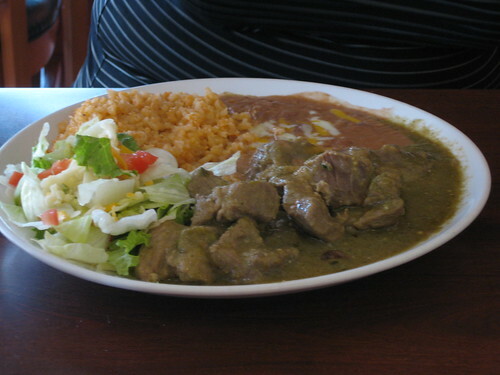 Glam enjoyed her chile verde plate ($6.75). The bite I had was quite tasty. 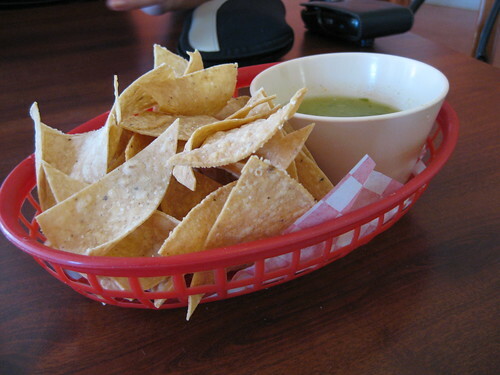 That green sauce, I tell you -- it's a key reason why we will return. 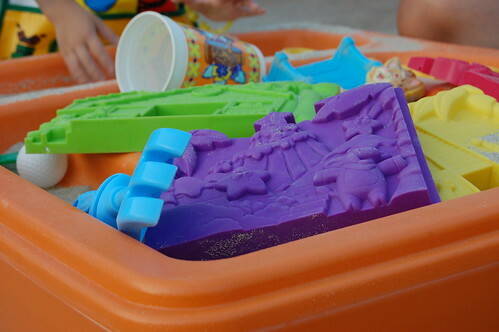 (4) Little Monkey Niece likes playing with her tiny personal sandbox. More in the next post. This is getting too long. And I've reached my hour limit. I liked the intro to this post. And I have some catching up to do myself. mmm i love good salsa verde/green sauce. 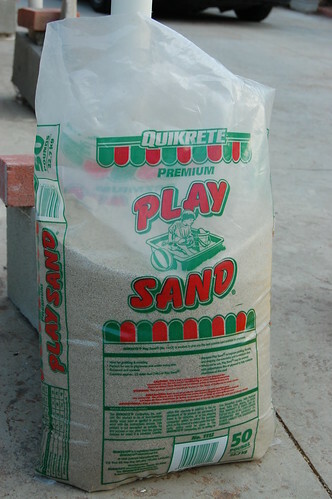 i wanted a mini sandbox like that when i was little. never got it. boo hoo. LMN is adorable. green salsa...yum! 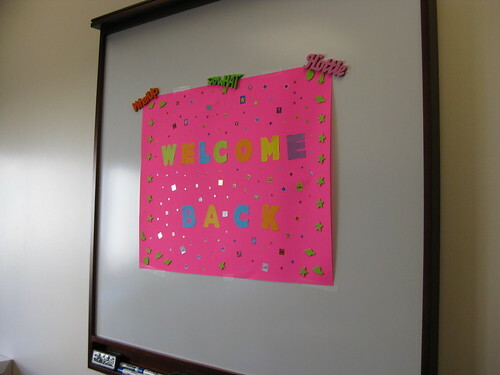 glad you're "back". missed you! I prefer to read, writing has always been a painful experience for me. hence the reason why my blog suckass and yours is one of my addictions. I want some of that green sauce! i must say though, the past few months you've been a rockstar with blogging. August was a busy tough month for me because I got evil looks if i wasn't painting and cleaning during all of my free time..
catching up totally stinks though! but reading catch up posts from other bloggers = fun times! ugh, i feel like i'm always playing catch up. Ugh. If only my computer at home would comply with the hour time limit. 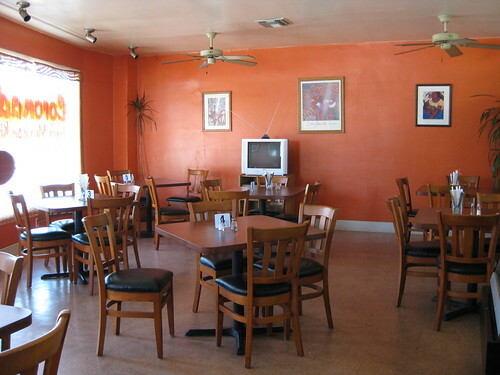 Your food outing looks good. I heart Mexican food. i like a window into your "process." mr. d WISHES I limited it to an hour. The writing comes easily once I have the pictures in order. Those damn dirty ape pictures just take so long. I often wonder what I'd do with my time before I blogged. Probably watch TV. Or talk on the phone. I am such a tween.